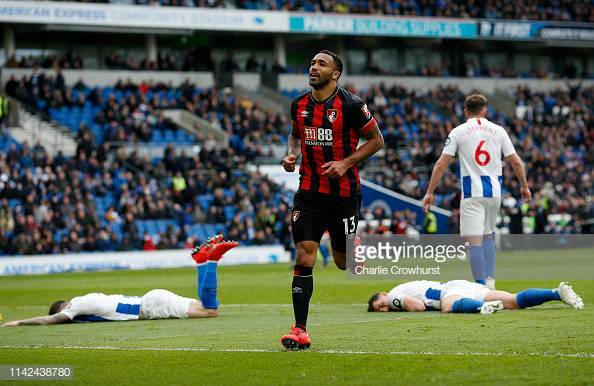 Callum Wilson celebrating scoring the fourth and Dunk and Duffy expression summed up the mood of Brighton players and fans. Image courtesy of Charlie Crowhurst on Getty Images. Brighton were left depleted and deflated after their 5-0 loss at home to Bournemouth. Brighton heightened their relegation fears with a 5-0 defeat at home to AFC Bournemouth. Albion went behind in the 33rd minute when Callum Wilson picked out Dan Gosling who put his effort into the bottom left corner. Ten minutes into the second half, Bournemouth doubled their lead in terrific style when Wilson broke away on the counter and played in Ryan Fraser, who powerfully struck his effort into the roof of the net. Things got worse for the Seagulls in the 68th minute, when Anthony Knockaert was given a straight red for a two-footed lunging tackle on Adam Smith, who was lucky to escape without an injury. With 15 minutes to go, Fraser turned provider setting up David Brooks to make it 3-0. In the 82nd minute, Fraser again was the provider playing the ball in behind to Wilson who slotted the ball in the bottom corner to make it 4-0. In stoppage time it was 5-0 after Brooks set up substitute Junior Stanislas. Brighton weren't putting in their greatest performance up till Knockaert's red card, but it was a needless tackle and one that cost them. The tackle was a two-footed lunge from a good few yards away on Smith, who was in possession at the time and Knockaert ended up going into his knee. It was a tackle that could have ended Smith career or at least his season, but the full-back walked away unscathed. Knockaert's red card will mean he is banned for three straight games for his reckless action, which could cost Albion even more not having him available. One thing is for sure, Knockaert will certainly be left to regret his actions after what unfolded after his dismissal and the fact he will now be missing for three games. Although Brighton played terribly, Bournemouth certainly turned up. Both of Wilson and Fraser particularly stood out with their performances. Wilson ended up with a goal and an assist and was a constant threat with his pace and ability to pick the right pass. Fraser scored the goal of the match and also got two assists. The Scottish winger will certainly only have raised interest in him after his goal and his overall performance.